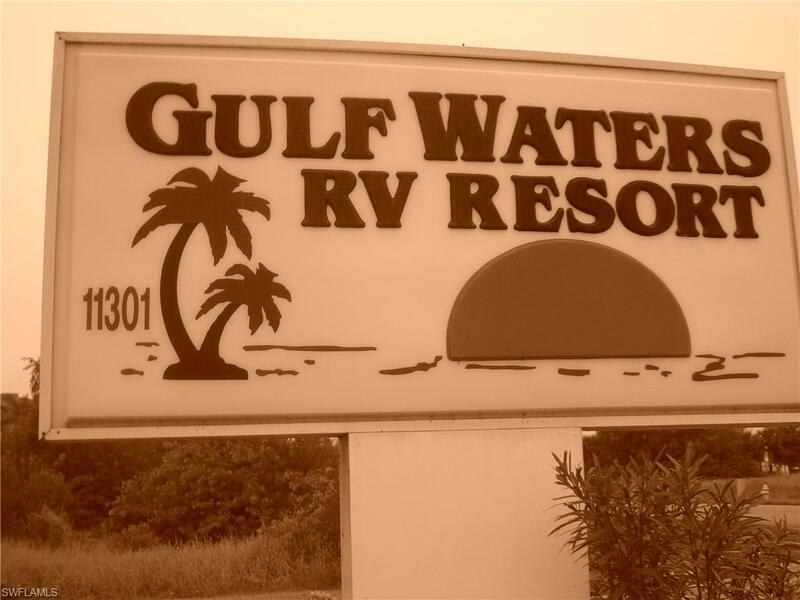 Gulf Waters Rv Resort: When you say Gulf Waters RV community the word that comes to mind is FUN! This is a 5 star rated resort! The high end lot is already landscaped and with pavers! Come see why this is the premier RV community in SW Florida! Fort Myers Beach is the address and that comes with lots of restaurants and shopping! But it is before the bridge so without the traffic! Check out all the great amenities including LOTS of activities and POOL and SPA with restaurant and TIKI HUT that is the heart of this community! Come own your piece of paradise! This high end resort has lots to do and new friends just waiting to meet you! Bank financing available at 20% down. Re qualify assumption of $59,000 current first possible. Rents run up to 1950 per month during season. Current renter can stay or you can have immediate occupancy! Class A and 5th wheels only. Additional cargo trailer up to 30 feet allowed on this lot. Gulf Waters Rv Resort: Your PIECE of Florida Sunshine awaits! "Prime" RV lot in 5 Star Rated Resort ~ Gulf Waters RV Resort. The site for your home away from home is fully landscaped with an expansive concrete pad, equipped with sewer connection and 50 amp service. These sites rent for as much as $1736 per month during peak season! Pet friendly, GW is the PREMIER RV community in Southwest Florida. Amenities include 5000 sq ft community clubhouse, shuffleboard, Wi-Fi/Cable, designated pet area, pool, spa, corn hole, pickleball, tennis, horseshoes, basketball, large laundry building with bathrooms and showers, restaurant, and Tiki Hut! Plus, a socially active community ~ you'll enjoy activities such as line dancing, water aerobics, game night, Euchre, Hand and Foot, cycling, painting and more! Located on the Fort Myers side of the bridge, you'll appreciate easy beach access using the trolley service. Close to shopping, including Tanger Outlets, plus a myriad of dining options, theater, fitness centers, and Wal-Mart within walking distance. Your place in the sun awaits! Gulf Waters Rv Resort: Desired corner lot in gorgeous upscale RV Resort near beaches shopping and restaurants. Lot is beautiful and has been improved with pavers and landscaping with additional parking for a trailer. This makes the perfect winter get-away. Bayside Estates: Rare gulf access vacant lot in Bayside Estates, This lot is on a wide canal with a beautiful view. The rear of the lot is facing west. Lot size is approximately 50 by 104. Bayside Estates is a 55 and older manufactured home community within biking distance of both Ft Myers Beach and Sanibel. With bike paths to get you there! Bayside is an active community with activities and amenities galore. Build just the right home of your dreams! Buyers in Bayside Estates have an $1800 resale capital contribution fee. HOA fees in Bayside Estates are $475/quarter effective January 1, 2019, and the capital contribution will be $1,900. Hidden Harbor: Hidden Harbour on San Carlos Island, a NEW community with Multi Million Dollar homes! Build your dream house on this over-sized lot next to brand new homes. Walk to the white sand beaches of Fort Myers Beach, with a short distance to restaurants shops and the Time Square area and pier. There are not many lots available anymore with a 33931 zip code and this is the least expensive one around! Hyde Park: Here is your opportunity to build your custom dream home on Fort Myers Beach!!! This vacant residential lot is conveniently located to shopping dining & entertainment just a short walk away (Publix, Bayfront Bistro, Snookbight Marina-just to name a few). Here you will find the best of both worlds with easy access to the sugary white sand of the Beach & the bay just a short walk away. Call today to get your piece of paradise & lets turn your dream into a reality. Tip Top Terrace: One of a Kind, Private Peninsula home site, Direct Gulf access, 483' seawall and 150' driveway. House is buildable 31' x 80' Set back 15' approved variance, A variance from Lee County goes with property. Reducing canal set back on the south side from 25' to 15' Adjacent property has app. 5' x 67' easement. Beautiful location, great views! This property is under an acre, on the point, with a sea wall and views of Estero Bay Preserve State Park. Just 5 minutes from the back bay by boat, with no bridges to contend with, you are boating in the Gulf in just minutes. This lot is perfect for a 1500 - 1800 sq. ft. old Florida Key West style home. Build your dream home with room for a pool. Very nice neighborhood, off the main road and less than 10 minutes from Fort Myers Beach. Close to restaurants, shopping and Times Square. Make this lot your "special place", one-of-a-kind, dream home location, where everyone would be envious. Selling below accessed value. Case Subdivision: BUILD YOUR ISLAND GET-AWAY ON THIS FABULOUS FT MYERS BEACH LOT! THIS SINGLE FAMILY RESIDENTIAL HOME SITE IS LOCATED ON A NICE STREET AND ONLY A SHORT WALK TO THE BEACH WITH PUBLIC BEACH ACCESS CLOSE BY. WEEKLY RENTALS ARE ALLOWED HERE! APPROXIMATE LOT SIZE IS 80 X 97.... COMPARE THIS TO THE OTHERS THAT ARE AVAILABLE IN THIS PRICE RANGE! FT MYERS BEACH HAS MUCH TO OFFER, IN ADDITION TO THE SUGAR SAND BEACH, FAMOUS TIMES SQUARE AND PIER, WALK OR BIKE TO THE LIBRARY, BANK, PUBLIX OR TOPPS GROCERY STORES, CHOOSE FROM A VARIETY OF UNIQUE SHOPS AND RESTAURANTS, VISIT BAY OAKS COMMUNITY CENTER FOR BASEBALL OR SOCCER, A PLAYGROUND, PUBLIC POOL OR WALK ALONG MATANZAS PRESERVE'S NATURE PATHS AND WATCH THE DOLPHINS FROM THE PAVILLION ON ESTERO BAY. Gulf Heights: BEACH ACCESS ACCROSS THE STREET . This lot is zoned for weekly rentals!!! Ready to build on. Sign on the property. Come live the good life!!! Laguna Shores: Build your dream home steps from the beautiful beaches of the Gulf of Mexico! New building construction all around this beautiful residential lot. Zoned for weekly rentals and located on the south end of Fort Myers Beach -- easy on and easy off to Bonita Springs & Estero, North Naples & SWFL International Airport. Two deeded gulf access points for beach goers. Close to shopping, marinas & restaurants. Laguna Shores: BAY VIEWS Building Site !!! Located at the Southern Most part of the Island in a neighborhood surrounded by High End Gorgeous Homes! You can have your Custom Built Home only minutes to Naples & Bonita Springs as well as other features & amenities our barrier Island has to offer... all within minutes of your New Island Home. The view from your New Home is amazing! Watch the Dolphins Play while sipping your morning coffee and enjoy the beautiful sunrises each and every morning over the Estero Bay Waters. You can Dream it and You can Build Your Island Home today ! Palm Isles: Look at the Virtual Tour....Palm Isles is one of SW Florida's Best kept secrets. Just off Fort Myers Beach. Huge Waterfront Lot will accommodate any size home you choose. Premium Waterfront Lot with over 275' of Seawall and Dock. 2800 Square feet of Dock Surface. There is a 24000 lb Boat Lift with Bunks for a Catamaran or Monohull ( a $25,000.00 Upgrade ) Plus a 13,500 lb boat lift Also with Catamaran or Monohull Bunks ). The dock has electric, security lighting, motion sensors, Snook Lights and running water. The lot has compacted fill so you can build a ground floor home. We can Build to Suit and provide Architectural services to design your home or you can choose your own builder and architect. Lot is just under a half acre. Get the Beach feeling without the traffic. Short trip to the Back Bay and Gulf of Mexico. Laguna Shores: Situated South End o Fort Myers Beach Lot to build. Partial view to the gulf. Highly desirable for those who enjoy outings in Bonita or Naples. Laguna Shores: One of the few lots on the water left on the Island. The house next to this lot is also available for purchase and would make a very nice property either to build a new home or keeping it as a garden. Building plans and survey available. Sandpiper Village: Spectacular Building Site among Million Dollar Plus Homes... Nestled on a Wide Canal only five doors down from the Estero Bay Waters to the Gulf of Mexico! Totally New Seawall construction was just recently completed! A few short steps and you find yourself on your very own neighborhood Dedicated Deeded Beach Access. Walk to the Beach in just minutes, Boat to the Wide Open Gulf of Mexico through Big Carlos Pass & walk to the renowned Santini Marina Plaza with it's Full Service Fish Tale Marina, 8 Restaurants and multiple Resort Style Shops. You can have your Custom Built Home only minutes to Naples and Bonita Springs as well as all other features and amenities our barrier Island has to offer...all within minutes of your New Tropical Home. You can Build Your Island Home today ! Flamingo Park: Beautiful Gulf access waterfront lot at the desirable south end of Fort Myers beach. Least expensive waterfront lot on Fort Myers Beach. More than 185 feet of road frontage on this oversize property. Seawalled with electric in place. Build your dream home on this spectacular lot. Rare investment opportunity! Oversized canal front lots twice as big as typical canal front lots on the Island. Located in the highly sought north end of the Island in the weekly rental district.Zoned for both single and multi family use. Three minute walk to the Beach and five minutes to Downtown Times Square. The location is unique and is adjacent to a green Nature Preserve. Plans for both single and multi family homes are available.. Property may also be purchased with newly built single family home starting at $949,000.0. You may also purchase the three adjoining properties as a package with a combined total of 1.5 acres. This is the largest, vacant canal front property available on the Island. Town approval in hand for 3 single family homes or 3 duplexes, up to 6 units. All lots are oversized, up to 200' deep. Lots of room for pool and recreational areas. A multifamily complex or mini resort is a possibility as well. Property is clear and State permits in place for mangrove trimming. Discount is available for purchase of all four lots. These properties are in Flood Zone A and are ready to build on. Own you own piece of Paradise on beautiful Fort Myers Beach. Rare Investment Opportunity! Oversized canal front lots twice as big as typical canal front lots on the Island. Located in the highly sought North end of the Island in the weekly rental district. Zoning for both single and multi family use. Three minute walk to the Beach and five minutes to Downtown Times Square. This unique location is adjacent to a green Nature Preserve. Plans for single and multi family residences are available from an established Beach Builder. Property may also be purchased pre construction with single family home as low as $949,000.00. You may purchase all four properties as a package with 1.5 acres of land. This is the largest vacant canal front property on the Island with many possibilities. Multi family, single family, combined for a resort type development. Zoning allows for up to six units, three single family or three duplexes. Discount is available for purchase of all four properties. Investment potential is endless. Property is clear and permits are in hand for trimming of mangroves. These properties are ready to build on. This is a great opportunity to own your Waterfront, Gulf Access home on beautiful Fort Myers Beach.